Drivers trapped by wildfire flames are encouraged to wait for directions from authorities before turning around and driving the wrong way along clogged roadways. Thom Jensen reports. 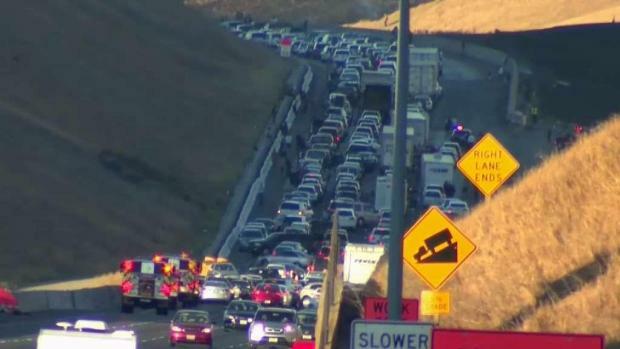 A brush fire in the Livermore Valley shut down Interstate 580 for hours Sunday evening, according to the California Highway Patrol and Cal Fire. The Grant Fire burned near North Flynn Road, and heavy smoke prompted the CHP to close all lanes of I-580 from Grant Line Road to Flynn Road, the CHP said. Just after midnight, fire officials stated that both directions of the freeway had reopened. Cal Fire announced Monday morning that the blaze was fully contained at 640 acres. Some vehicles traveling on westbound I-580 reportedly were turning around on the freeway to escape the traffic mess. A brush fire in the Livermore Valley shut down Interstate 580 for hours Sunday evening, according to the California Highway Patrol and Cal Fire. Thom Jensen reports. Dee Aquino, eight and a half months pregnant and driving along the freeway with her 2-year-old daughter in the back was stuck in the gridlock. "The smoke was so bad, everyone stopped," she said. "People started getting out on the freeway with their families." Asked if she saw cars coming toward her traveling in the wrong direction, she said that was what made it even messier. "Everyone started turning around both ways," Aquino said. Semis were trying to turn around. ... It was a little crazy over there." Fire crews from Alameda County, Oakland, Hayward, Fremont, Livermore-Pleasanton and San Ramon Valley assisted with the firefight, Cal Fire said. 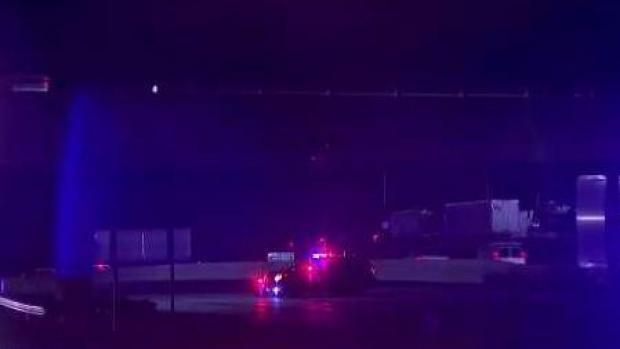 A brush fire in the Livermore Valley shut down Interstate 580 on Sunday evening, according to the California Highway Patrol and Cal Fire. Roz Plater reports.